This piece grew out of feeling provoked about the overshadowing focus on the carat of diamonds and gemstones. The necklace 84.5 ct has strong references to traditional collie necklace. 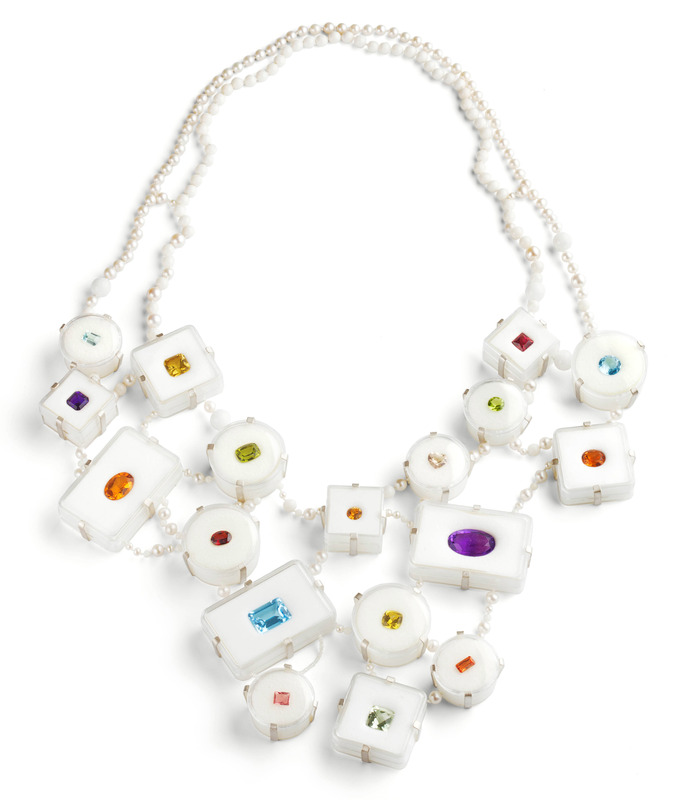 The piece consists of pearls, white coral and clear plastic boxes with precious gemstones. I have used the type of plastic boxes, for which jewelers usually buy loose stones, and used them as settings. All the elements were deliberately placed in a haphazard and asymmetrical way. In traditional goldsmithing material value is vital and jewelry containing precious stones are sometimes only characterized by their weight in carate – which insinuate that the craftsmanship is less important and just a functional necessity. The necklace 84.5KT is meant to comment and emphasize this factor with a humorous touch and a modern look - it’s a carat show off. Siver, corals, freshwater pearls, plastic boxes, tourmalines, topazes, periods, aquamarines, garnet, citrines, amethyst, spessetite, phrasiolit, amesin.